BECOME a guide for others in RECONNECTING and discovering RESILIENCE ! Climate Change. Biodiversity loss. Deforestation. Ocean Acidification. Overpopulation. These are just some of the crises of our unprecedented times. We need leading edge solutions. Psychology can play a part in helping to change attitude, perception and behavior and the most appropriate form of psychology is one that reconnects the human animal with the rest of life on earth. 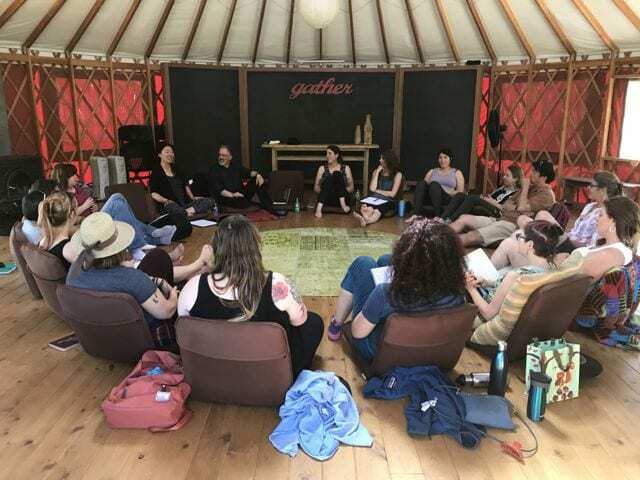 Come learn with leaders in the field as you develop community, go deeply into a range of eco-therapy practices and prepare yourself to lead others and offer solutions to the fundamental needs of our time. 100 CEUS will be available for MFTs, LCSWs, as well as psychologists and RNs(approval pending). The training will prepare participants to deeply understand and translate the framework of ecopsychology in a range of applications, including traditional clinical psychology settings as well as in community leadership, eco-therapy practices and creative endeavors. 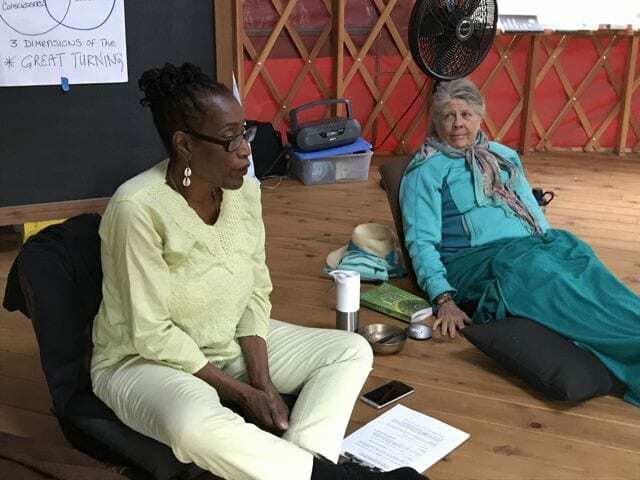 At the completion of the program, participants will be certified by Holos Institute, a leader in ecopsychological practices, to confidently offer ecotherapy and eco-based healing practices in the greater community. This program is geared toward clinicians but is also open to other healing arts professional or people interested in translating a nature-based connection into positive action and/or healing. The program will cover, in-depth, the concepts and principles of ecopsychology, the origins of the field, and many of the intricacies of its clinical application both within a traditional, in-office setting as well as in outdoor therapy. We will be looking at the psychology of individuals from archetypal patterns to developmental, somatic and attachment theory lens. We will also be addressing the ever growing need to meet the anxiety and grief of climate change and environmental degradation. We hope that this program will also inspire participants to become community/environmental leaders in a creative and heartfelt way meeting the concerns that are arising in the current planetary situation. The program is a blend of didactic learning processes along with deeply experiential components that help to integrate the learning more deeply and ground the material in a profound personal experience. The immersive long weekends will build on previous ones as this very special cohort of trainees bond and have exceptionally deep time with the land. The last 3 intensives will be held in a vast valley where the wildness of the land invites the wildness of the psyche. This certificate program is unique in that it is not representing one viewpoint but rather engaging many diverse voices whom all speak passionately about caring for our planet. We have enlisted an incredible community of elders and spokespeople who are leaders in ecopsychology and environmental stewardship. The program will be lead by seasoned clinicians who offer their personal insights into eco-therapy, ecopsychological approaches and earth-based practices applicable to both individuals and groups, but it also offers the wisdom of many other great teachers, inviting their wisdom in-depth. These will include the field of permaculture with Penny Livingston and James Stark, mapping the psyche and soulcrafting with Geneen Haugen and Bill Plotkin, Joanna Macy’s Work that Reconnects with Constance Washburn, Hakomi/eco-somatic processes with Rob Fisher and Hu Ting Ting and numerous pioneers leaders in the field of ecopsychology. The program has been created and curated by Mary Good, MFT and Jan Edl Stein, MFT and they will be the primary organizers/instructors. The program is composed of 4 thematic modules, each with a 3 or 4 night residential component with alternate week 2 hour webinars. The program launches on Saturday, March 17, 2018 with an introductory seminar, followed by the first residential program on March 24. Please see the schedule for more details. If you are interested in applying please first send an email to jan@holosinstitute.net explaining your situation. If we have space we will accept your application. To apply, kindly fill out the following application form and paying the $50 application fee (non-refundable/ but credited toward fee) via PayPal. If you have trouble sending payment through this connection, you can simply send the fee via PayPal to “events@holosinstitue.net” using the “send money to friends and family” option. OR… if you need to send the fee via check or credit card, just give us a call at (415.751.1307). If you are mailing payment, send to EVENTS, Holos Institute, 312 3rd Ave., San Francisco, CA 94118. Your application is considered complete when we receive both this online application form and your payment. We may contact you if we have any additional questions for you. By applying you acknowledge that you understand the program curriculum and are comfortable with the level of clinical material that will be presented. If you have any questions, concerns, or special needs please do reach out to us via phone or email. If you will need tuition assistance by way of the few work/trade positions available, or a payment plan, kindly let us know your request and your circumstances via a separate email to events@holosinstitute.net. Use the subject line: certificate program financial assistance. Thank you! We are excited to offer this incredible program and so welcome your interest! This certificate program is a comprehensive, 100+ hour training (including CEUS for MFTs, LCSWs, psychologists and RNs). The program will cover, in-depth, the concepts and principles of ecopsychology, the origins of the field, and many of the intricacies of its clinical application both within a traditional, in-office setting as well as in outdoor therapy. We will also be addressing the ever growing need to meet the anxiety and grief of climate change and environmental degradation. We hope that this program will also inspire participants to become community/environmental leaders in a creative and heartfelt way meeting the concerns that are arising in the current planetary situation. The program is a blend of didactic learning processes along with deeply experiential components that help to integrate the learning more deeply and ground the material in a profound personal experience. The program is structured in 4 modules, each with it’s own residential intensive with alternate week 2 hour webinars. Each module will include a 4 or 5 day residential, experiential and didactic process where we may all deepen into the work. Webinars will be held on alternate Saturday mornings (10:00 am – noon PST) . There are 10 webinars total. Participants will also have 2 one-on-one meetings with an ecotherapist practitioner to help refine their individual relationship to the work. There will be both required and recommended reading. Note: The program and faculty are subject to change as instructor schedules shift and new instructors join us. The basic orientation of ecopsychology. We will offer an overview of the history and theoretical underpinnings. 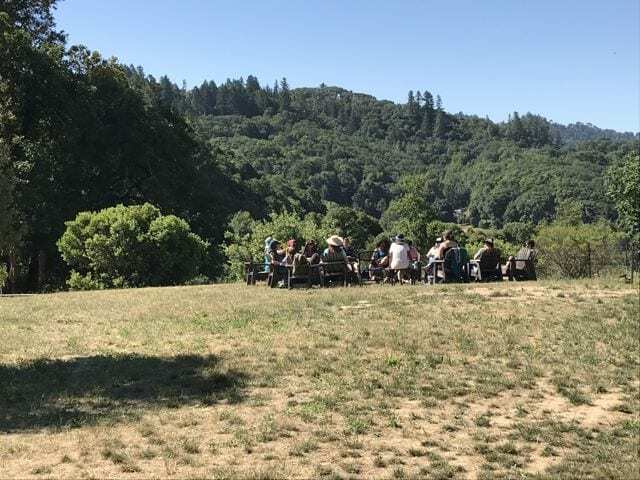 The intensive (4 day/3 night) will include a sampling of interpretations (via the Ecopsych Conference), a depth psychology application daylong workshop with Bill Plotkin, PhD and a daylong permaculture principles introduced by James Stark at the Regenerative Design Institute. 3 2-hour webinars will fill in and “connect the dots” of this rich information. Clinical applications both in and outside of the office, clinical considerations and techniques and practical guidance of eco-therapy practices including naturalist knowing for guides. The intensive (4 day/3 night) will offer an in-depth workshop on applications of eco-psychology in the therapy room, practices of eco-therapy, considerations of moving the clinical container outdoors, practical “nuts and bolts”, somatic processes in nature based therapy and deepening into relationship with the natural world for the practitioner. A voyage into practices that support hope and resilience, sustainable and inspiring practices that connect and build psychological, spiritual and sensate practice integration. In this module we will look at a number of approaches that offer support and processes for climate change anxiety and grief. We will consider practices and attitudes of many cultures and discuss diversity and social justice. 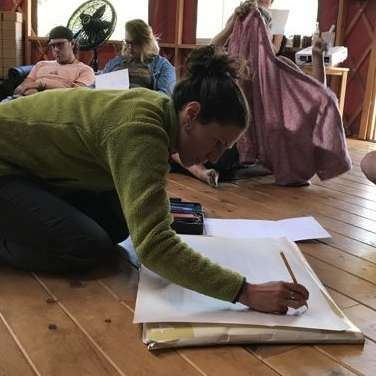 The intensive (4 day/3 night) will primarily focus on Joanna Macy’s “The Work that Reconnects” and diversity considerations as taught by Constance Washburn. The 4 webinars will bring in voices/leaders of diversity. Grounding applications into practice including creative/art for ecotherapy, somatic considerations and work with the creative unconscious. This will also be a period of reflection and integration of all that has been learned. The residential module (5 day/4 night) will also include solo time on the land with a mindful council for sharing. The first residential will be hosted at the Earthrise Retreat Center of the Institute of Noetic Sciences and will include participation in the Holos Ecopsychology Conference where program participants will have a taste of many leading voices in ecopsychology, followed by a daylong workshop with Bill Plotkin and another daylong workshop at the Regenerative Design Institute in Bolinas on the psychological implications of permaculture, all of which will be grounded in an exclusive container of the certificate program trainees. 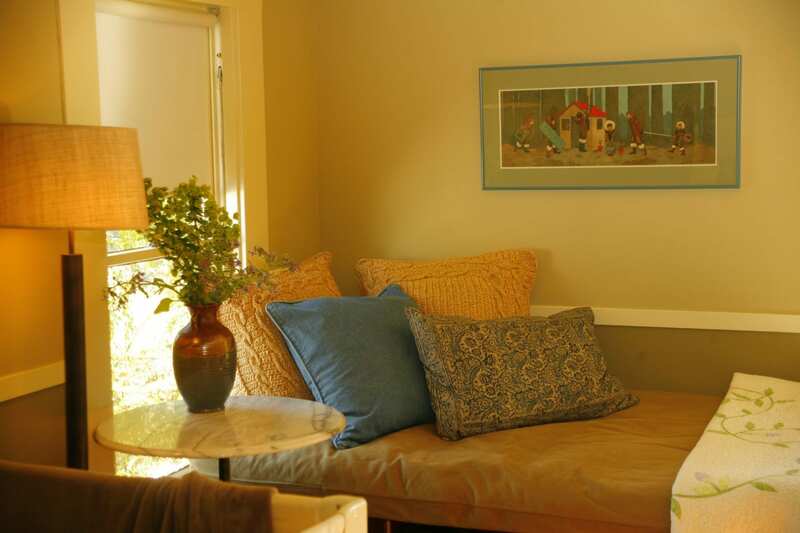 For bay area locals, on-site residence is recommended but not required. 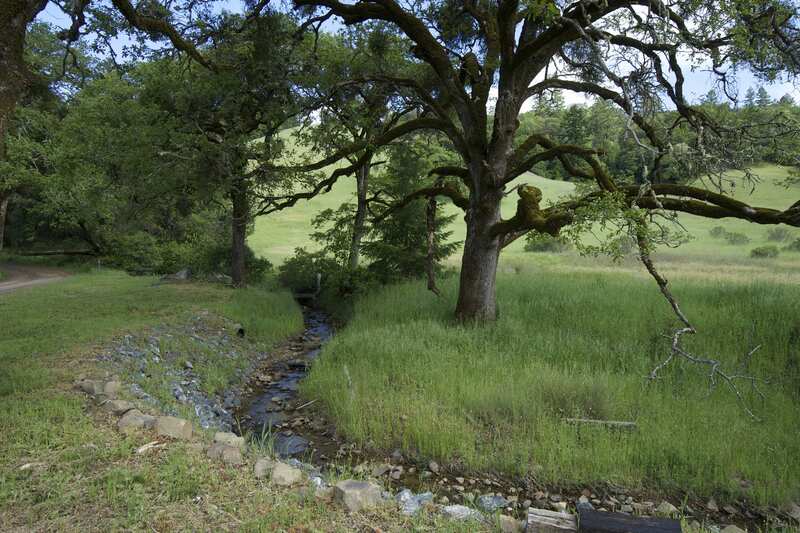 The following 3 residential modules will be hosted at a private retreat center in the inland, rolling hills of Mendocino County where on 650 areas of land we will have deeply stimulating didactic processes interspersed with nature-based experiences on the land to digest and integrate the material. These residential experiences will allow us to go deep and allow space for personal reflection. The retreat center is a rustic/elegant space that is very well appointed and incredibly comfortable and inviting. 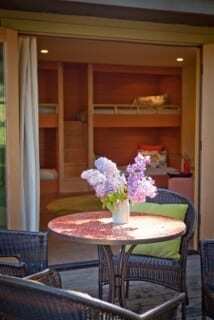 We will share meals in an elegant turn-of-the-century farmhouse and enjoy meeting in a spacious hill top yurt with many hiking trails, a swimmable pond, and many more delightful surprises. The 10 interspersed webinars will offer a format for digesting the rich material from the residential modules as well as introducing some new teachers and exploring new ideas in the field. As the intersectionality of Environmental and Social Justice issues emerge. They emphasize that “we are all in this together”, and Ecoresilience helps balances the disturbances that are happening we can learn, adapt and manage. Two individual meetings with an ecotherapist mentor scheduled privately over the summer. Each student is expected to complete a project that reflects some aspect of how they will integrate the program into their work. The may be a research paper, designing a group eco-program, practice with individual ecotherapy, a personal reflection project, etc. These capstone projects should be completed over summer. 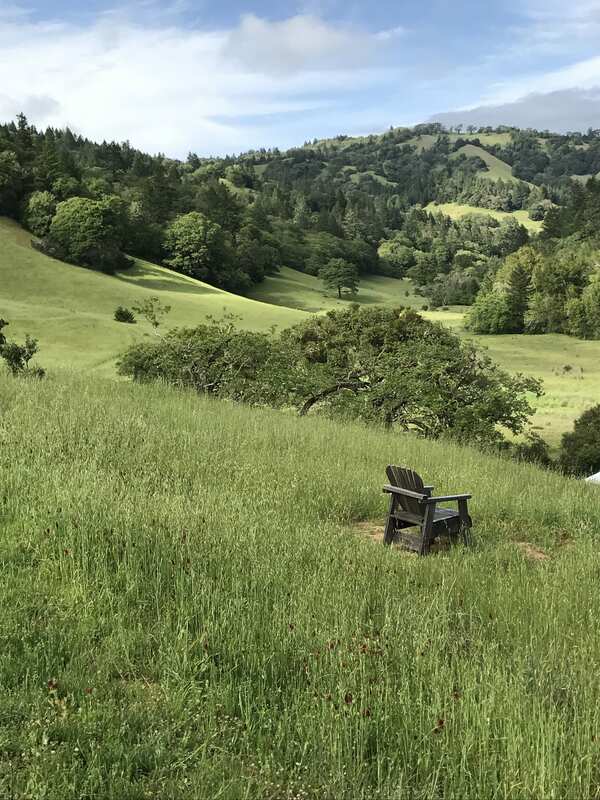 Our March intensive will be hosted at the Earthrise Retreat Center in Petaluma, CA which is part of the Institute of Noetic Sciences. Residence at the center is optional for locals who wish to save as a commuter for this weekend. 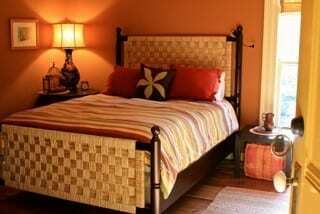 We will have rooms reserved at the center for Friday through Sunday night in the retreat center lodging which is standard hotel style rooms with 2 twin beds. There are a variety of accommodations. These range from an elegant farm house to more rustic rooms. Some are close to the main house/dining room and some are more remote. 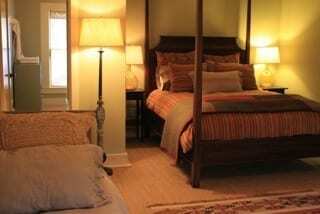 All are very comfortable and beautifully furnished. 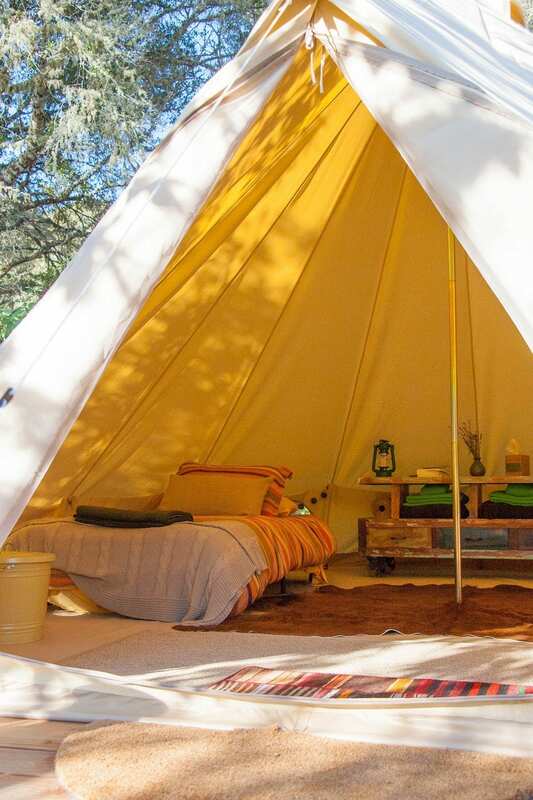 Permanent “glamping” tents on gorgeous rolling hills with bathroom access a short walk from the tents. 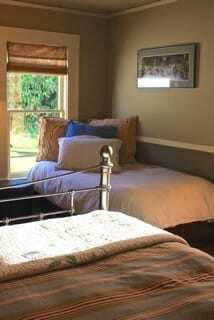 Upstairs in a classic country barn with shared half bath and short walk to shower house. 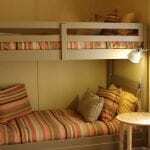 Bunk beds in spacious octagonal building with own kitchen and full bath. Graciously restored four bedroom farmhouse. Some rooms with en-suite. 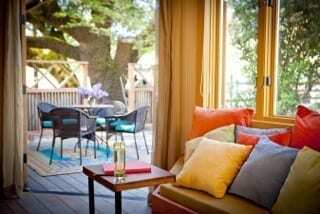 Our meeting space will be a lovely knoll top yurt, outdoor theater and many comfortable places to sit outdoors. The center has an extensive system of hiking trails and a swimmable pond. Delicious, organic and locally sourced meals (with many options for food preferences) will be shared in the main farmhouse dining room. All webinars will be managed from the Zoom platform. participants need only a computer or tablet to connect into the conversation. We will walk everyone through the process of setting this up but it will be very easy. The intensives will require trainees to be present in person and, at least for the last 3 intensives, to stay overnight. We will do our best to arrange carpools, and in the case of people coming in from outside the bay area, we will help coordinate your transportation. If you are using air travel to come to the bay area for the intensives, please speak with either Jan or Mary BEFORE booking your flights. We will help you sort out best times to arrive and transportation to/from either the Oakland or San Francisco airport. You will be sent information well in advance of each intensive on how to prepare and what to bring, etc. The cost of this 100 hour program, including all lodging, meals, tuition and fees is $4,400 per person. This does not cover travel expenses to each of the 4 residential modules. An application fee of $50 is non-refundable but will be applied to the fee if accepted. A non-refundable $500 deposit will secure your place in the program within a week of acceptance. One half of the balance is due by Feb 1, 2018. The final balance is due March 15, 2018. Single lodging supplement – add $260 per each of the 4 residentials. PLEASE NOTE: We will do our best to make this affordable for candidates who sincerely want to attend. We are seeking outside funding to offer deeper scholarships and will work with you to make this affordable as reasonably as possible. Payments may be made via check, PayPal or credit card. Anyone withdrawing from the program in writing before February 1, 2018 will be refunded 75% of any fees currently paid. Anyone withdrawing from the program in writing before March 1, 2018 will be refunded 50% of any fees currently paid. Anyone withdrawing from the program in writing on or after March 1, 2018 but before April 1, 2018 will be refunded 25% of any fees currently paid. This course meets the qualifications for 100 hours of continuing education credit for MFTs, LCSWs, LPCCs and LEPs as required by the California Board of Behavior Sciences. Holos Institute is approved by the California Association of Marriage and Family Therapists to sponsor continuing education for MFTs, LCSWs, LPCCs and LEPs . Holos maintains responsibility for this program/course and its content. 100 CEs for psychologists and RNs will be provided (pending) by the Spiritual Competency Resource Center. The Spiritual Competency Resource Center is approved by the American Psychological Association to sponsor continuing education for psychologists and by the California Board of Registered Nursing (BRN Provider CEP10318) for licensed nurses in California. The Spiritual Competency Resource Center maintains responsibility for the program and its content. For questions about CE visit www.spiritualcompetency.com or contactDavid Lukoff, PhD at david.lukoff@gmail.com. Out of state licensees should consult their local boards to determine reciprocity. Holos director, Jan Edl Stein, MFT and ecotherapist, Mary Good, MFT are the primary instructors, guides and developers of this program. Jan and Mary will lead and/or support all of the sessions while coordinating with an extraordinary cast of guest instructors. Below is a list of all of the currently confirmed instructors who will be providing in-person training. We have many more who are still in exploration who will either join us to be in person at one of the residentials or will participate in a webinar. Accepted trainees in the program will also have a list of skilled and seasoned practicing eco-therapists from which to chose a mentorship relationship that will support them through the program. 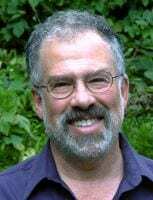 Bill Plotkin, PhD, is a depth psychologist, wilderness guide, and agent of cultural evolution. 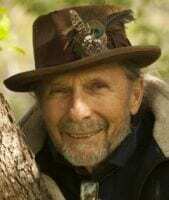 As founder of western Colorado’s Animas ValleyInstitute in 1981, he has guided thousands of women and men through nature-based initiatory passages, including a contemporary, Western adaptation of the pan-cultural vision quest. Previously, he has been a research psychologist (studying non-ordinary states of consciousness), professor of psychology, psychotherapist, rock musician, and whitewater river guide. In 1979, on a solo winter ascent of an Adirondack peak, Bill experienced a call to adventure, leading him to abandon academia in search of his true calling. Bill is the author of Soulcraft: Crossing into the Mysteries of Nature and Psyche (an experiential guidebook), Nature and the Human Soul: Cultivating Wholeness and Community in a Fragmented World (a nature-based stage model of human development through the entire lifespan), and Wild Mind: A Field Guide to the Human Psyche (an ecocentric map of the psyche — for healing, growing whole, and cultural transformation). He has a doctorate in psychology from the University of Colorado at Boulder. James Stark, M.A., F.E.S., is the co-director of the Regenerative Design Institute at Commonweal (RDI). He considers the programs and the garden at RDI to bea nursery for growing visions of the new era, and providing skills and tools to bring those visions to life. He co-founded and currently co-directs the Ecology of Leadership and co-founded and continues as guest instructor in the Ecology of Awakening programs which prepare community leaders for the “Great Turning” of our era. James has committed his life to exploring how we — ourselves, our communities, and our species — might move into harmony with who we are and re-ignite a deep connection with the natural world. A large part of that work is focused on cultivating vitality in all areas of our lives -physical, mental, emotional and spiritual. 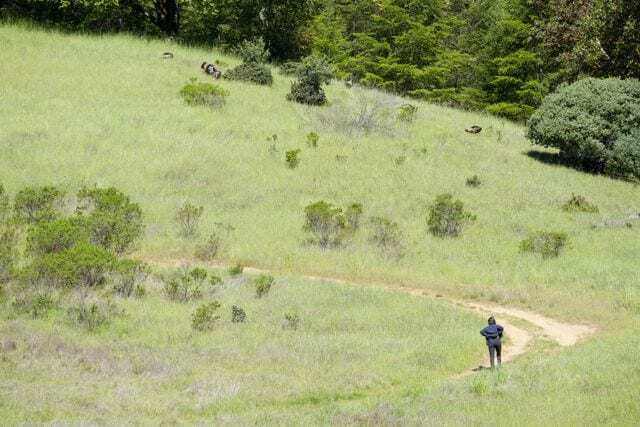 For decades, James dedicated himself to community visioning and organizing in Marin County. James’ years working with visioning and community development service led him to an interest in exploring how a healthy inner ecology can impact one’s work in the world. As part of that inquiry, he earned a master’s degree in Spiritual Psychology from the University of Santa Monica. Like the natural systems and patterns that guide permaculture, his work now is focused on helping others to lead from the inside out and source their lives from deep nature connection. He believes that creating a loving, peaceful inner world provides the soil for the seeds of our visions to grow in the world and lead a fully expressed life of vitality. 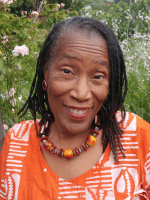 Constance Washburn, Is a a workshop leader and educator with over 35 years of experience designing programs which inspire and build deep connections toourselves, each other, and the natural world. With 40 years of Buddhist meditation practice and 25 years of yoga practice, Constance uses mindfulness and movement techniques to increase awareness and connection to our inner knowing. 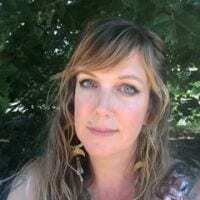 As a facilitator of the “Work That Reconnects”, she uses my theater background and deep nature connection to create powerful experiences for participants. Having studied with Joanna Macy for over 20 years she am steeped in the Work and able to design and deliver workshops which address a wide range of issues; climate change, racial wounds, relationship to money, elderhood and aging. 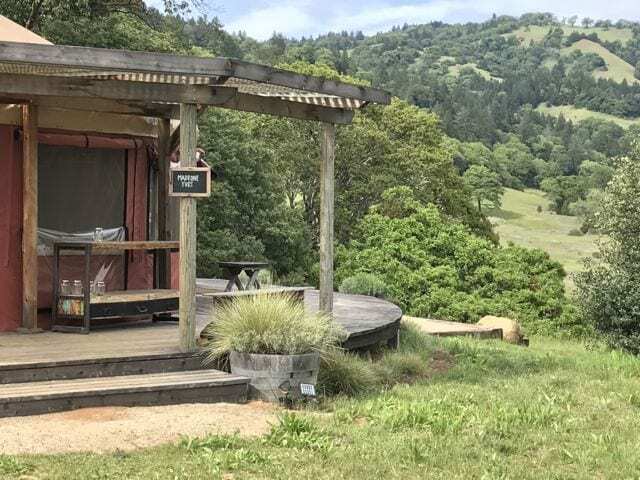 For 18 years as Education Director at the Marin Agricultural Land Trust and then at Marin Organic, Constance built connections to the food and farms of West Marin as well as expanding awareness, memberships, and funding. 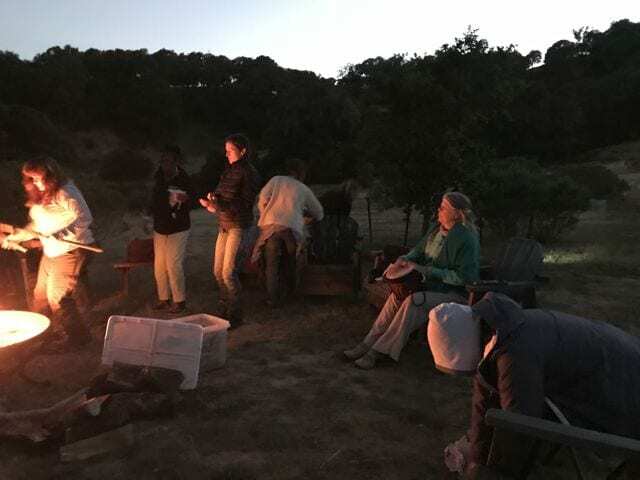 She was part of founding the Marin Agriculture and Education Alliance in 1998 which created Marin’s first Agricultural Institute for Teachers and launched the Farm Field Studies program, providing hands-on and magical experiences on farms for thousands of K-12 students. MAEA also created a blue print for collaboration across sectors to build a local healthy food system which has been very successful in Marin County. Rob Fisher, MFT is a psychotherapist, consultant and CAMFT certified supervisor in private practice in Mill Valley, CA. 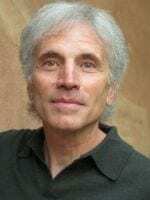 He is an adjunct professor at JFKUniversity and the co-developer of the Certificate Program in Mindfulness and Compassion for Psychotherapists at CIIS in San Francisco. A Certified Hakomi Trainer, Rob teaches Hakomi Mindful Somatic Psychology internationally. He is also the author of Experiential Psychotherapy with Couples, A Guide for the Creative Pragmatist, published by Zeig/Tucker, in addition to numerous articles and book chapters published in the US and abroad. Rob has been a Master and Peer Presenter at annual CAMFT Conferences, the USABP Conference, the Couples Conference and Psychotherapy Networker Conference. 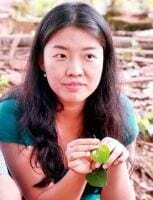 Hu Ting Ting, MA is a Mindfulness Based Stress Reduction (MBSR) teacher candidate from Beijing, China who teaches Mindfulness and the Heart of Natureworkshops with Rob Fisher. She is a co-founder of Teach for China, the largest non-profit educational agency in China. She consults to corporations in mindfulness programming, maintains a mindfulness coaching practice and teaches mindfulness in the psychology department of Beijing University. 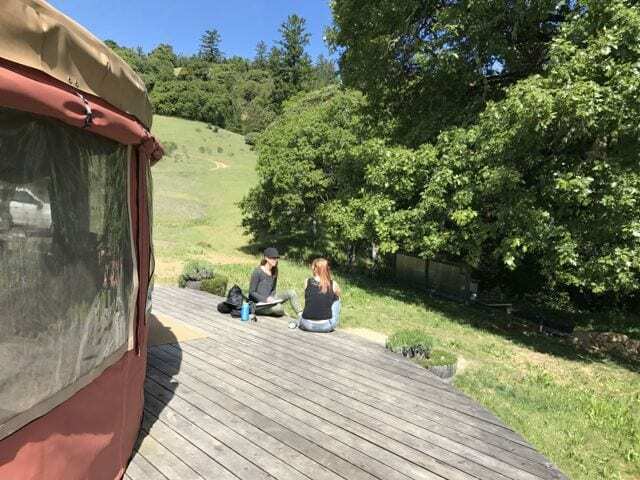 Ting Ting and Rob recently co-taught Mindfulness and the Heart of Nature workshops in the rainy, verdant jungles of southern China and near the Great Wall outside of Beijing as well as in Mill Valley, California.